Pilots, cabin crew members and air traffic controllers, frustrated by outdated protocols for medical certification which lead to lengthy delays and unnecessary and expensive appeals, will by this September begin benefiting from a major systemic upgrade. An over-reliance by South Africa's Civil Aviation Authority (CAA) on the underresourced military for the verification of medical certificates plus the lack of a clear definition of 'acceptable medical risk' are now being addressed as top priorities. A vital additional quality assurance instrument will be the newly formed 15-member Aeromedical Committee, established by the CAA late this April to supplement and bolster the SA Military Health Services' longstanding Institute for Aviation Medicine (IAM). 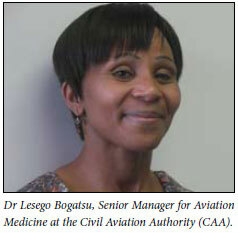 Explaining the reasons for the overhaul, Dr Lesego Bogatsu, Senior Manager for Aviation Medicine at the CAA, said insufficient specialists available to adjudicate cases plus the redeployment of military doctors meant verification backlogs had built up. Other challenges included outdated medical protocols (some of them requiring identical medical criteria for cabin crew members,pilotsandairtrafficcontrollers),the lack of an integrated information technology system between stakeholders, administrative errors and limited participation of medical universities in the overall risk minimising process. She said that Colonel Noel Ndlhovu, Officer in Command at the IAM, had 'given his word' that the verification backlog would be cleared within 3 months. Bogatsu's baseline research shows that 97% of all applicants who appealed their medical grounding via the civil aviation commissioner between January 2000 and December 2008 were later found to be medically fit by an independent panel of specialist advisors. She discovered that there was 'limited understanding' of and confusion in the interpretation of the Civil Aviation Technical Standards, a typical example being the finding of applicants 'permanently unfit', a category not included in the standards. The terms 'temporarily unfit' and 'unfit' in defining medical standards were used interchangeably, leading to confusion among applicants, unnecessary medical appeals and even litigation. Her investigation which forms part of her Master's thesis, plus advances in medical science and technology, required the CAA to 'urgently reduce the number of medical unfitness appeals' by (among other things) investing in research. There was a need to define acceptable medical risk to suit the South African environment and to implement strategies to mitigate the risk to the CAA, while terms such as 'medical unfitness', 'temporary medical unfitness' and 'unfitness' needed clearer definition to reduce medical appeals and litigation. Another shortfall was the lack of routine collection and analysis of data on incapacitation in-flight and on active duty. South Africa was one of the few countries that strongly disadvantaged licensed cabin crew and recreational pilots by requiring the higher medical protocols applicable to commercial pilots. 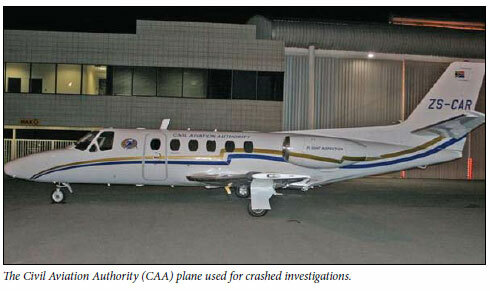 Bogatsu reviewed 2 521 cases presented at the Institute for Aviation Medicine over 8 years (Jan 2000 -Dec 2008). She found that patterns of morbidity most commonly associated with temporary unfitness, unfitness and 'permanent unfitness' were neurological, cardiovascular and psychiatric. Most disqualifications were related to the central nervous system (29.34%), with head injuries and convulsions the most common in this medical category. The cardiovascular system accounted for the second most common cause of medical unfitness, with coronary artery disease and hypertension dominant. Psychiatric conditions (12.9%) were the third most common, with depression and substance abuse responsible for most medical groundings in this discipline. Captain Colin Jordaan, Director of the CAA, said at the launch of the new Aeromedical Committee at the Rand Airport on 28 April that its composition of experts from various medical universities and organisations would ensure accredited medical conclusions were reached and that the CAA kept abreast with International Best Practice. He said the IAM and the CAA had agreed to actively recruit appropriately qualified doctors to help clear the verification backlog and provide additional training to improve the quality assurance skills needed. Gaps in the medical protocols had been identified and outdated protocols would be reviewed by the end of September this year. Captain Jordaan said that 'the human component' was the cause of 70% of aviation accidents. The aircraft environment differed from other occupational environments in respect of altitude stressors. These included hypoxia, noise and vibration, low humidity (leading to dehydration), fatigue, decompression syndrome, acceleration and spatial disorientation. Aviation medicine came into existence during World War I, when it was realised that more pilots died due to medical incapacity than were killed by enemy gunfire. Once medical standards were introduced, fatality rates dropped 'significantly'.